Hi 小斯 ! Sorry there’s another query…. whereas for VisaSignature, only 3.6% rebate? Amazon JP & US ，payment 用 JPY / USD / HKD 好? IHERB.COM，payment 用 USD / HKD 好? Hotel booking (e.g. Agoda, Hotels.com) ， payment 用 hotel’s local currency / HKD 好? 請問去cheaptickets.hk買機票用visa signature of citi premium miles 好? 你好，想問下用任何AE卡去expedia.com.hk 或 agoda.com 或 hotel.com 訂酒店有冇額外費用(DCC)？所簽金額是否計算為首3個月內的迎新簽賬？謝謝! 我早幾日係trip.com 唔小心用左人仔比, 之後即刻係trip.com canncel 左張單, 但係佢退比我 中間銀行收左我3.99% 係 charge? Me too, they charged 1% for all my DCC transactions! 即係如果我係澳洲碌VISA SIGNATURE , 佢問我比港紙定澳紙, 我揀左港紙, 即係當本地? 另外CITI Cash Back Vise信用咭有沒有收DCC費用? 有現金回贈嗎? 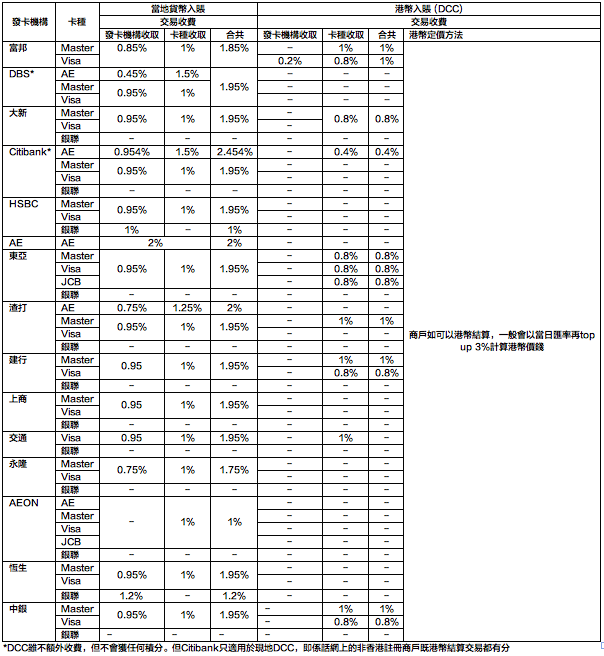 中信 Motion DCC 收 1%. 2) 我會係adoga / hotel.com / 樂天訂酒店, 用當地貨幣定用hkd比, 邊樣好d? 請問怛生銀行visa card 的rate (外幣簽賬), 是否特別高? Currently using SCB AM & BEA World Flyer. If I pay with non-HKD currency from iHerb (URL http://www.iherb.com/), do I need to pay DCC handling charge? Also, will I earn miles as well? 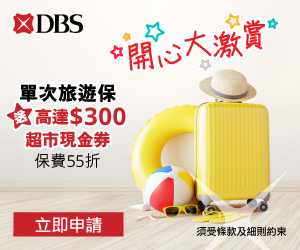 想請教一下如果用Expedia訂酒店, 唔想比DDC及想要有積分, 應該用AE Elite or HSBC visa signature? After reading your advice, is it right to say the best to use the following 1-3 for japan shopping, for booking hotels at Japanican, book direct at japan hotels, pay when arrive at japanese hotels? Because I am thinking which one to apply for my japan trip. one is good enough or I should apply all? 1. 從上表中, 渣打 Master Card 收1% DCC charge, 但最佳信用卡組合嘅渣打 Asia Miles Master Card 冇 ‘#’ ? 2. 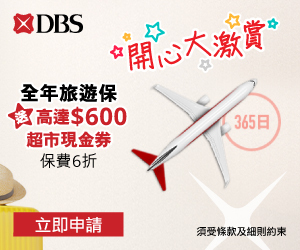 如果用渣打 Asia Miles Master Card 從網上DCC消費 (e.g. expedia.com.hk, hotels.com), 是否 entitle 積分 (i.e. 換 asia miles) ? DBS Black Master Card 如果上網比 e.g. Airbnb (用HKD結算, DCC) 有無積分? 係咪都係$6/里? 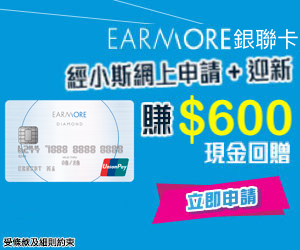 年薪岩岩過150k.有渣打銀聯(平時for旅行用),citi bank reward master card. 想儲asia miles去一次歐州,諗住搵屋企人(年薪過300k) 開東亞flyer world for 屋企開支(水,電,交雜費)&八達通自動贈值 (屋企人同我既交通費都唔少,要過海),將醫療保險轉年繳自動轉帳會唔會有分儲?? 屋企人開張附屬卡比我用, d分會儲係主卡定分左2個戶口度?如果係主卡,我要將分轉去asia miles出機票比自己,係咪唯有係asia miles 度開family account? 另外想儲avios miles去日本. 諗住開大新張avios, 睇過冇任何既迎新優惠同埋首3年免費,咁過左3年係咪點都要收錢? 另外開Executive Club會唔會有link 去申請會有avios送,佢要申請左Executive Club先會將大新簽帳既錢轉做avios miles, 渣打有link 申請asia miles有1000里送,唔知Executive Club又有冇? 睇過ana miles(大新ana visa/ ana visa) 去日本都好似唔錯咁,去一次日本(ana機票係咪連同行人都可以儲?日本酒店網就200yen/里,ctip 3蚊人仔/里) 都儲到唔少ana miles.